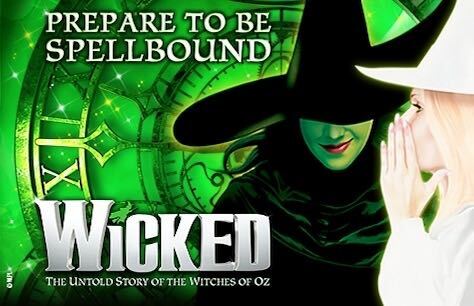 Defy Gravity with Wicked, one of London's most beloved musicals. WICKED, the smash hit musical that tells the incredible untold story of the Witches of Oz, is pleased to announce the opening of its 25th new booking period on Monday (22 January 2018). Over 500,000 new tickets for “the world class West End musical” (Official London Theatre) are being released, with booking extended to Saturday 25 May 2019. “The gravity-defying Wizard of Oz prequel” (Time Out London) recently became the 7th longest running show currently playing in the West End. Already also the 14th longest running show in West End theatre history, WICKED has been seen by over 8.5 million people at London’s Apollo Victoria Theatre and played almost 5000 performances. Around the world, WICKED has won over 100 major awards, including ten theatregoer-voted WhatsOnStage Awards (winning ‘Best West End Show’ on three occasions) and two Olivier Audience Awards in the UK. Children under 3 will not be admitted. Children under 16 years must be accompanied by an adult. Wicked is suitable for a general audience. As a guide to parents and guardians, it is recommended for ages 7+. All persons entering the theatre, regardless of age, must have a ticket. Children under 3 years of age will not be admitted. Attendance of children between the ages of 3 and 7 is at the parents’ discretion and if the child becomes restless it is the parents’ responsibility to take them out of the auditorium. Children under 16 years cannot watch the show if unaccompanied by an adult.